I’m a Swedish 32 years old swedish guy who’s been writing novels and books in Swedish since I was a teenager. 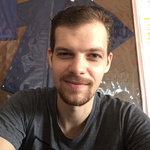 Now I’m leaving in the Philippines and I’ve been working with tourism...Read moreI’m a Swedish 32 years old swedish guy who’s been writing novels and books in Swedish since I was a teenager. Now I’m leaving in the Philippines and I’ve been working with tourism in Manila and banaue for over two years handling costumers from all over the world on a daily basis.